If you’ve seen Epic Games’ HTML5 port of ‘Epic Citadel’, you have no doubt been impressed by the amazing performance and level of detail. A lot of the code that creates the cool visual effects you see on screen are written as shaders linked together in programs – these are specialized programs that are evaluated directly on the GPU to provide high performance real-time visual effects. Starting in Firefox 27 we’ve introduced a new tool called the ‘Shader Editor’ that makes working with shader programs much simpler: the editor lists all shader programs running in the WebGL context, and you can live-edit shaders and see immediate results without interrupting any animations or state. Additionally editing shaders should not impact WebGL performance. Open the Toolbox by pressing either F12 or Ctrl/Cmd + Shift + I.
Click on the ‘gear’ icon near the top edge of the Toolbox to open the ‘Toolbox Options’. On the left-hand side under ‘Default Firefox Developer Tools’ make sure ‘Shader Editor’ is checked. You should immediately see a new ‘Shader Editor’ Tool tab. On the left you have a list of programs, a vertex and fragment shader corresponds to each program and their source is displayed and syntax highlighted in the editors on the right. 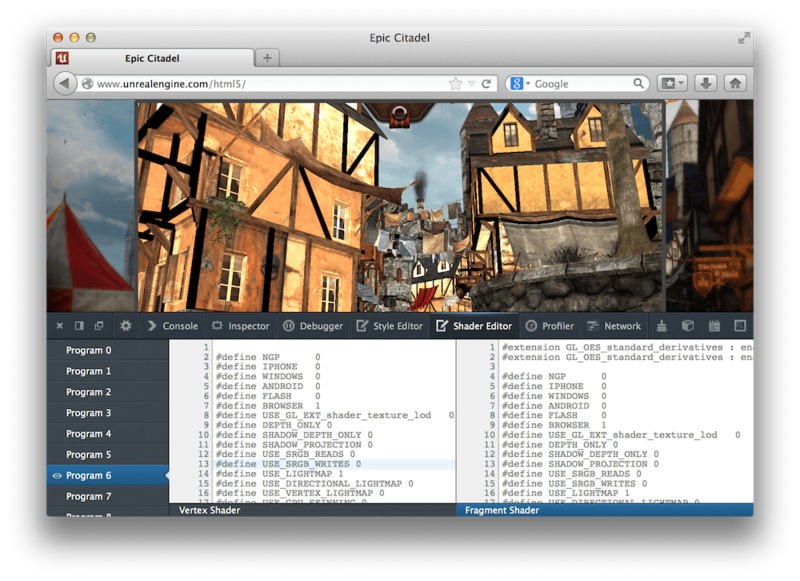 The shader type is displayed underneath each editor. Hovering a program highlights the geometry drawn by its corresponding shaders in red – this is useful for finding the right program to work on. Clicking on the eyeball right next to each program hides the rendered geometry (useful in the likely case an author wants to focus solely on some geometry but not other, or to hide overlapping geometry). The tool is responsive when docked to the side. If an error was made in the code, the rendering won’t be affected, but an error will be displayed in the editor, highlighting the faulty line of code; hovering the icon gutter will display a tooltip describing the error. Learn more about the Shader Editor on the Mozilla Developer Network. Thanks for this update, the shader editor looks very useful and very cool! Having the option in the developer tools totally makes sense. I dont know how feasible that is but I wonder, would it be possible to have an automatic mode to add shader tab when the page contains WebGL, and remove it for pages that don’t. I think that would be a cool feature, and the UX for doing that can probably be re-used for simillar tools that only apply to certain group of apps/pages. That certainly makes sense. We’ll look into showing the tab by default on pages with WebGL content. Great stuff. And now I’m waiting for CSS shaders! Please make it happen guys. The idea is to use vertex and fragment shaders as custom CSS filters. This is awesome! Does opengl provide the shader compilation errors, or are you guys rolling your own syntax checking / parsing? In fact, they are rather (in most cases) provided by the ANGLE shader compiler, which is what we use on all platforms to validate shaders and translate them to WebGL’s dialect of GLSL to regular GLSL (or HLSL on Windows). Good to see DevTools breaking new ground and complimenting Firebug. Wow! Will this work regardless of the method of drawing (asm.js library, ThreeJS, etc.)? This tool should work with all WebGL content. Very nice work here. I tried this on our engine and I am happy that this works for real apps, not just demos. * Bold code in #ifdef blocks that evaluate to true. * Mouse over a pixel and show the shader used. Mouse over a pixel and show a profile of the fragment shader. No problem, right? * An option to see only shaders used in a frame, instead of all shaders in the WebGL context, since many shaders may be for culled objects. Taking it a step further, the display could be decluttered more by only showing shaders for non-occluded fragments. So the tool is great, everyone appreciates this, really cool, and thank you. Now let me just skip to the bad part… I don’t know if this was mentioned anywhere, but currently there is nothing in the editor to show you which #ifdef-s are active. E.g. if I try to open any threejs demo, I have lots of conditions there, and it is not immediately obvious if particular code is active. I need to go up and check every condition against #define-s at the top. This is terrible :) Can something be done about this? maybe simply out inactive sections of the shader in grey, like comments? Any solution to this problem would make it perfect! Yes, that is good option, too. Since I guess the shader is not going to be just copy-pasted from shader editor any way, only specific parts will be edited by hand.